Tom Faletti goes out of his way to build models that aren't likely to replicated by many other modelers. 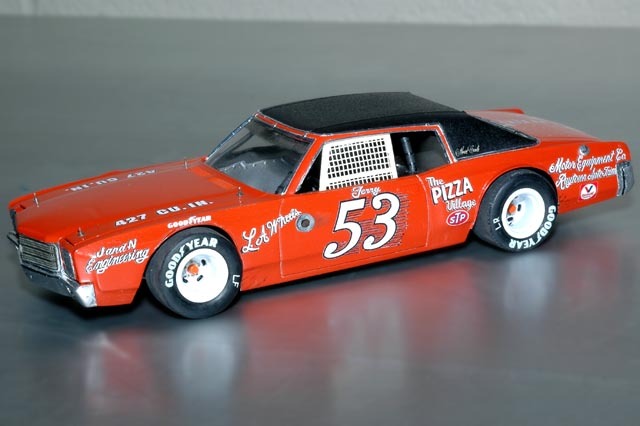 This time around he's modeled the 1971 Chevrolet Monte Carlo Super Stocker driven by Kansas City legend Terry Bivins. Bivins was a multi-time track champion at several short tracks (dirt and paved) across the Missouri and Kansas region. He eventually ran NASCAR Winston Cup Series in the mid-1970's, finishing 8th in the 1976 Dayton 500 and being runner-up for the 1976 NASCAR Rookie of the year. Starting with the AMT/Model King release of the Monte Carlo Super Stocker kit, Tom added a vinyl roof using Rustoleum textured paint. Tom added photoetched grille, emblems, and hood pins from a variety of aftermarket suppliers. He coated the body with Duplicolor Chrysler Hemi Orange engine paint topped-off with a set of custom decals that are now available through Bullring Graphix produces the decal set.